From “The Wolf of Wall Street” to “American Hustle,” the year 2013 has seen a lot of criminals on the big screen, and nobody has known what to do with them. Do we hate them because they are criminals? Or do we try and understand their situation because they are human? These are the two questions at the heart of “The Act of Killing,” a riveting documentary that shows that both of these questions are right and wrong at the same time. “The Act of Killing” brings a lesser known tragedy to light. Following a failed coup in Indonesia, a bunch of low level gangsters were hired to lead a death squad that eventually killed thousands (though the number fluctuates depending on who you ask) of supposed Communists from 1965-66. 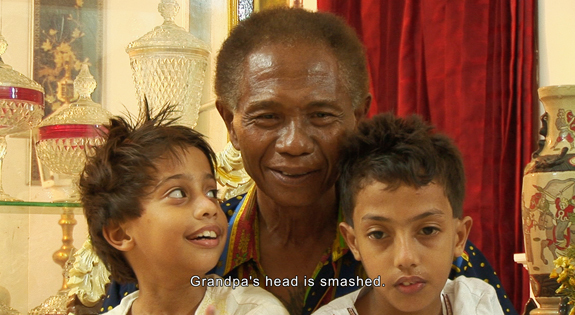 Director Joshua Oppenheimer does not treat this as the typical rise-and-fall story of gangsters. There is no glory period, and no justice. It is just old men with a different outlook on life. The film was originally going to be a series of interviews with the surviving victims. Based on a suggestion from one of the victims, Oppenheimer instead decided to interview the killers. It’s a bold choice that is ultimately very wise, as the mark of a good documentary is to bring up a new perspective. The boldest choice the film makes is that rather than just talk about what they did, Oppenheimer has them reenact their brutal killings. The two men in focus, Anwar Congo and Adi Zulkadry, were heavily influenced by movies and many of their murders were inspired by what they saw in gangster movies and westerns. The reenactments eventually blur the line between reality and fantasy, as they mix feverish nightmares with movie references. “The Act of Killing” is largely about how these men viewed morality as flexible. The film itself challenges the moral standards of everyone who watches it, as we are allowing these terrible men to become celebrities based on the crimes that they committed. However, as the film goes on, it is clear that Oppenheimer’s mission is much deeper than just that. I admit, writing this review is not easy, as “The Act of Killing” is not a film that can be described in so few words, because the emotional response anyone might have to it is so complex and all over the map. This is a film that does not need cinematic trickery in order to play with your emotions: all it needs is a man proudly describing how he murdered somebody by choking them with a wire in order to confront evil. Yes, right now a real guy who cut a real person’s head off is talking, and nothing he is saying is made up. It is hard to say that most documentaries are “important to see” because a lot of the time, you can find the same information by reading about it online. “The Act of Killing” is different, as it is as much about the actual event as it is an examination of what truly lies at the heart of evil. The film doesn’t give you the answer you want to hear, and even when there is a moment of redemption, the emotional punishment feels tough when you realize that bad people are just people. People who, like you, might also enjoy feeding ducks and watching Al Pacino movies. Most films about history’s greatest tragedies, such as “Schindler’s List” and “12 Years a Slave,” can be masterful but also only merit one viewing. They are just too painful to revisit. “The Act of Killing” is painful too, but it is so entertaining (and weirdly funny) that I could see myself watching it another time. In one of the funny scenes, one of the former death squad members shows his collection of precious items he has collected from around the world. One of them is a singing Billy Bass. I have been watching “The Sopranos” for the first time recently, and there is a Billy Bass used prominently in a nightmare sequence to show Tony’s guilt. “The Act of Killing” is also about guilt. It’s definitely interesting to view these two together. Now, make that fish shut up. Anwar Congo will definitely go down as one of the most memorable villains ever show on screen. The roof scene. That’s all I’ll say. You’ll understand when you see it. “The Act of Killing” is a truly beautiful film. Pay attention to the sound. Despite the past horrors that still effect Indonesia today, this is a bustling and growing country that is teaming with life. That “Anonymous” that you see in the credits is not the Internet hacker nor Banksy. It is an unidentified Indonesian crew member. Werner Herzog and Errol Morris are both credited as Executive Producers. Pretty good people to have supporting your documentary. 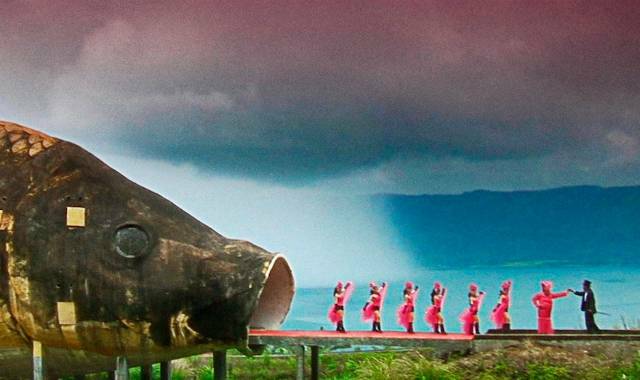 This entry was posted in Uncategorized and tagged Documentary, Errol Morris, Indonesia, Joshua Oppenheimer, Movie Review, The Act of Killing, Werner Herzog on February 6, 2014 by ian0592.